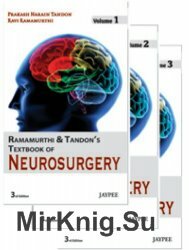 This third edition is a comprehensive guide to Neurosurgery. Divided into three volumes, the textbook has been fully updated and includes 100 additional chapters covering recent advances in anatomy, physiology and differential diagnosis. With contributions from authors in the UK, USA, Canada, Middle East and South East Asia, this new edition covers a wide range of topics including history and diagnosis, spinal injuries, peripheral nerve, cranial and intracranial tumours, and vascular disorders. Packed with more than 1800 colour diagrams, illustrations and radiological images, the treatment of various neurosurgical subspecialties such as epilepsy and cerebral palsy, is also discussed.